The Zipster is rated 4.3 out of 5 by 10. Rated 4 out of 5 by CSimps1 from A good alternative to an arm band I wanted an alternative to the arm band style phone carrier when I upgraded to the iPhone Plus so I didn't look silly with that giant phone on my arm. This is good that it holds my phone and car key securely during runs, but my iPhone Plus just barely fits in the zippered pocket and I have to remove my very slim case to get it in, so I am not super happy about that. I wish the zipper was just 2cm longer and then it would be great. Based on reviews I ordered a size smaller than the size chart measurements and it fits securely around my high hip and does not shift during running. The fabric is a bit heavy which keeps it from bouncing when the pockets are full but it does get a little hot in higher temperatures and humidity. Overall a good product that I would recommend. Rated 4 out of 5 by Lynne S from Doesn't fit Note 9, Samsung I got this a few days ago hoping my new phone would fit into it. Got the Samsung Note 9 today and, as I honestly expected, it doesn't fit. It will fit into the foldover pockets, but the phone is too costly not to secure in a zipper pouch. I did manage to squeeze it into a zipper pouch after much forceful wrestling w/ it, but it's a tight fit and I'm sure the zipper will eventually scratch it up. I know it won't fit at all once I put on a protective case. 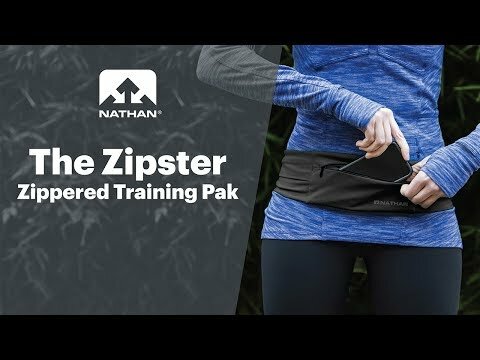 Nathan, PLEASE hurry in making a Zipster for a Note 9, and consider giving us at least 1/2" to 3/4" "wiggle room" for fast in-and-out pulls. Other than that, I absolutely love how it fits, how comfortable it is to wear (the minute I had it on), and I can't wait to get one that works for me. Rated 5 out of 5 by CCarp from Great Product! I felt that this product was amazing! I always used the arm bands to hold my phone, but it always annoyed me. I barely even notice the Zipster on my waist, it is so comfortable and fits great! My iphone XR fits just right in here, I usually take off the case for easy glide. I ordered an XS because of another review. I would normally get a Small in things, but I'm glad I got an XS in this. I wear a size 2 in pants so that you have a reference. You want this to be a little snug so that it stays in place, I recommend going a size down from what you would normally wear in running shorts. Looking forward to training and running my half marathon with this! Rated 5 out of 5 by Scott from Needed Storage to Run Hands Free My running shorts never had enough storage space in order to run hands Free. The Zipster can hold my Google Pixel XL phone, keys, gels, etc. I bought a medium and it fits perfectly. It doesn't move around at the same time it doesn't restrict my movements. I am very happy with my purchase. Rated 3 out of 5 by Neil M. from Maybe order a size down I measured myself and ordered based on the size chart but it isn't snug enough to actually stay put. Basically useless since its slides off me when running and jumping rope. Rated 2 out of 5 by Photogrl from Stuff got wet Zippered pockets are not sweat or weather resistant. My phone, keys and wallet got sweaty when out walking and when it started to rain, got wetter. Not happy about that as I bought it for the weather and sweat resistant feature. Rated 5 out of 5 by Jaye G. from Best ever!!! Do NOT hesitate to get this product, it's changed my running life forever. Thanks Nathan! !